For at least 14 years I've kept my URL base and password data in FileMaker Pro for PC and Mac. I periodically exported the data to my Palm, using an old database app with support for encryption (JFile). It worked, so I haven't touched it for years. Now it's one more thing I have to transition from my Palm to the iPhone. I was hoping that FileMaker would resurrect FileMaker Mobile for the iPhone, and add encryption. That would be perfect. Alas, I don't see it. So I'm looking at dedicated password storage apps like the list on the left, including 1Password, eWallet, SplashID, etc. It has to work on the iPhone (native app). It has to have good export options. There has to be a good demo app I can test. 1Password seems to meet the criteria, and it has plug-ins for Firefox and Safari. I write "seems" because the web site says nothing about the limitations of the downloaded version. If I run into limitations that make it hard to test then I'll put 1Password down at the bottom of my list. The above screenshot shows it can import in many formats. 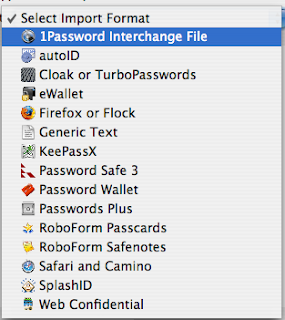 More importantly, it can also export as tab delimited and as 1Password Interchange File. ... In addition to the above formats, 1Password has a Generic Importer that can import any Comma or Tab Separated Values. To use this, specify Generic Text as the Import Format. Problem is, I need to know what all the possible import choices are, so I can create an export from FileMaker Pro for further testing. My FM database has a much richer organizational scheme than 1Password can support, including two types of classification, tags/keywords, extensive notes, those insane "secret questions", search across all fields, and more. It's also shareable with Emily in a way that 1Password is not. So I'm not sure I'll give up on the FM database, but it looks like I can, for the moment, export it to 1Password so it's available on my iPhone. At $35 1Password isn't cheap, but if it passes my import test I may go for it. As best I can tell Columns titled "Notes" 1-5 are concatenated into the 1Password Note field. I used Notes 1 for my description field and Notes 2 for a calculation field that concatenated several FM fields. Search runs against Title and Notes, so this concatenation works for my purposes. One major limitation is that you can import into Web Form and Secure Note, but you cannot import "Wallet items". You can export Wallet items however. The inability to import a wallet item is very annoying, though I can see why that is a harder task for the developer. Wallet items use a different data model for each type of item, so a tab import is less likely to work. I will probably use "Secure Note" for another JFile database that holds that type of information. I turned off my 10.4 firewall and was able to sync. I'll try it later with the firewall enabled and the port they recommend set up. Update 8/14/08: I think 1Password uses the OS X Keychain. That has some nice features, but it is unbelievably slow to delete large numbers of items or add large numbers from an import. Slow, as in seconds per transaction! It feels like AppleScript speed. Update 9/2/08: Unbelievable. I went to buy 1Password, and I learned it uses a "license token". I hate those, because they're a pain to backup and manage. I want a registration code. I'm going to contact support, but this is a real stinker of a deal killer. Update 9/4/08: About the same time as I wrote my 9/2 post, 1Password relented. The current version supports entering a text un/registration number that they provide via email. I found out because I let them know why I wasn't going to buy 1Password, and they quickly responded that I wasn't the only person who was unhappy with the encrypted token approach -- and they were now providing both options. So I bought it. Update 7/15/09: I use 1Password still. It's been through several updates, sometimes with new bugs. I've also discovered it uses an Input Manager -- something I really try to avoid because of all the associated bugs and complications. I'd recommend an application that didn't use an Input Manager, though I'll stick with 1 Password for now. Nice post and thanks for having posted the updates. I wish there were more reviews maintained like this.